The Agrawal Sabha, Korba nominates the office bearers to Shri Agrasen Shikshan Samiti, Korba, and the managing body for the educational institutions, registered with the Registrar of Firms & Societies. Situated in the heart of city, on Darri Road Korba, the college building is built on a land measuring about 1.30 Acre. The main building is surrounded by available land for playgrounds, cultural activities, canteen facility and space for parking inside the secure boundaries of the campus. Shri Agrasen Girls College, Korba offers various graduate courses as well as Post Graduate courses. 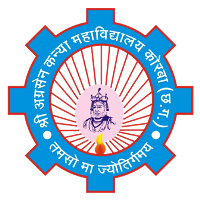 Shri Agrasen Girls College, Korba is affiliated to Bilaspur University (BU), Bilaspur - Atal Bihari Vajpayee Vishwavidyalaya. List of facilities available at Shri Agrasen Girls College, Korba for students.